There are several way for you to move backup data to cloud such as Microsoft Azure. Item (a) and (b) will act as gateway to tier data to Azure Storage. Another option is setup Veeam repository on Azure. Veeam repository is a storage location used by Veeam Backup & Replication job to store backup files, copies of VMs and metadata for replicated VMs. -> Azure Network for Site to Site VPN. However, some people prefer to use Azure Storage only. Question is "Can we use Azure Files? " 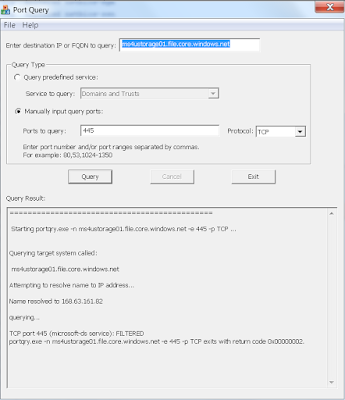 According to Azure Files blog (https://docs.microsoft.com/en-us/azure/storage/storage-dotnet-how-to-use-files), we can mount the file share from an on-premise client running Windows. Install a version of Windows which supports SMB 3.0. Windows will leverage SMB 3.0 encryption to securely transfer data between your on-premises client and the Azure file share in the cloud. 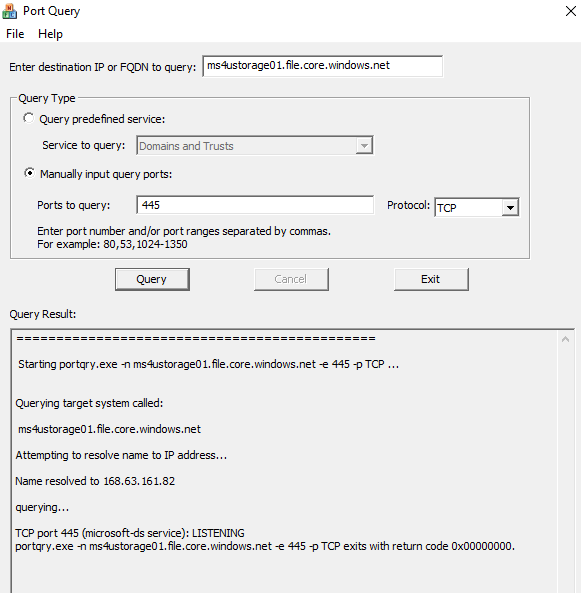 Open Internet access for port 445 (TCP Outbound) in your local network, as is required by the SMB protocol." 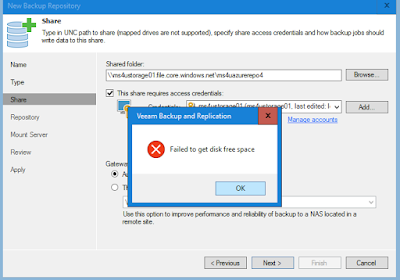 Encountered an error message "path was not found"
On Veeam console, we tried to add as CIFS shared as backup repository. Also encountered an error message. 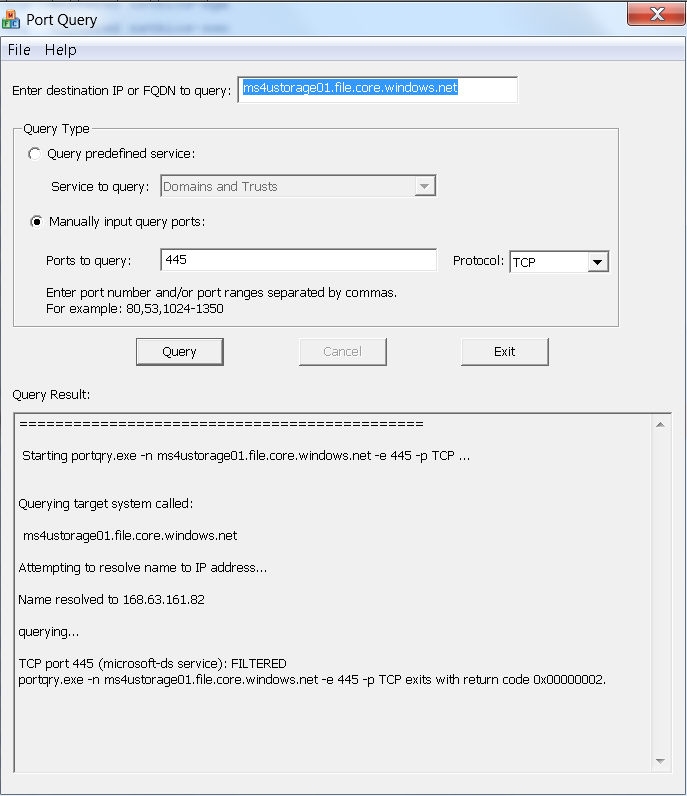 We dig deeper by running portquery. 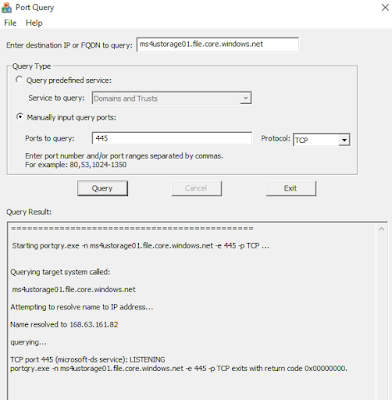 Portquery result for on-premise showed "FILTERED"
Portquery result for Azure VM showed "LISTENING"
Meanwhile, another ISP "Innet Solutions Sdn Bhd" has port 445 open and mount file share on on-premise work fine. 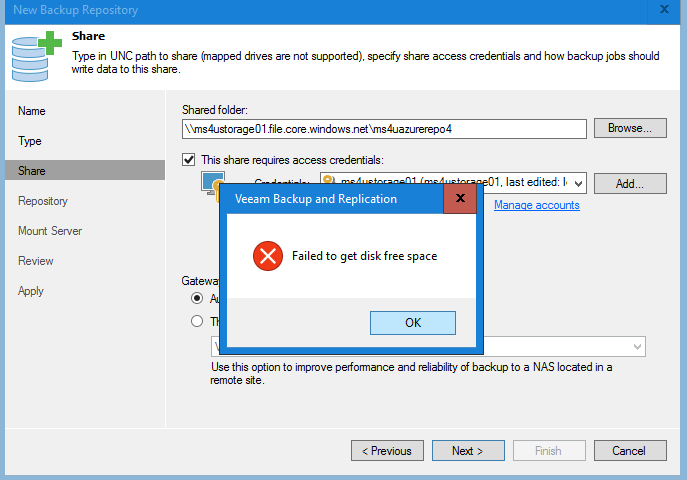 Therefore, we don't advise to use Azure Files as veeam backup repository on on-premise unless you have test it on your environment.